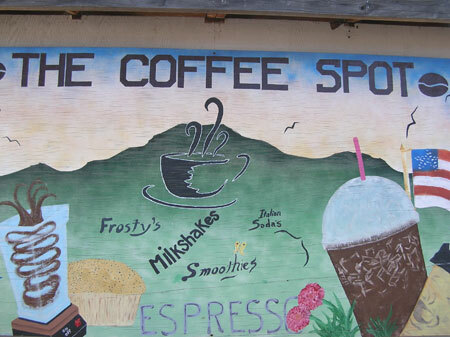 On the way to the Kingston/Edmonds ferry, I encountered a drink called an expresso shake. That'll definitely get your heart started. "Waiting for the uppertaker, not the undertaker," so says one church sign. Bill's Garage at Chimacum is closed from August 4-14, written on a white board that rests in the window, message inked with erasable marker. Water can also be wilderness, so I thought it appropriate to play some songs by "The Sons of the Pioneers", lead by one Leonard Franklin Slye (Roy Rogers - b. Cincinnati, Ohio, November 5, 1911; d. July 6, 1998) while I motored towards the ferry spot. Yipee i oh ti-ay! Yippee i oh ti-ay! Riding the range on water. Big logging trucks wait too. Everyone gets to go. Saw a heron while I loitered. Watched it circle about. Felt like home. "Government: If it ain't broke, fix it till it is," so says the bumper sticker on the Chevy van over in the next lane. In Washington state, the water is the land that needs to be crossed. There is so much of it, it can't help but be prairie. Guy in front of me. His Trigger is an Oldsmobile Regency, tan older Palomino, rusty red top. There's cigarette smoke blasting out the driver's side window, and pressed clean shirts hanging by the right passenger side door. He's talking on the phone while he's waitin' for the schooner to arrive. Many people get out of their cars, stretch, readjust their shorts or pants or skirts. Last chance call comes from the harbormaster. Get in line or get lost for the 9:25 a.m.
You can see Mt. Rainier kinda ghostly behind the Seattle skyline from these ferry windows. Rt. 104 East continues across the water, so the ferry is your fastest hope of connecting with Rt. 5 South towards the city. When you land, Edmond's main street becomes 104 East once again. Fresh off the boat, the Oldsmobile cowboy steps on the gas and yells a mighty hi ho and is away, blasting up the road, passing Geos and lumber trucks that make the little blue Bug tremble in their wake. Yippee i oh ti-ay! Yippee i oh ti-ay! Yippee i oh ti-ay!